Each year, hundreds of bars, nightclubs, and brands descend on the Las Vegas Convention Center for the Nightclub and Bar Show. The show is a key place for manufacturers to debut new products, spirits, and gadgets all aimed at making the beverage biz better and more profitable. 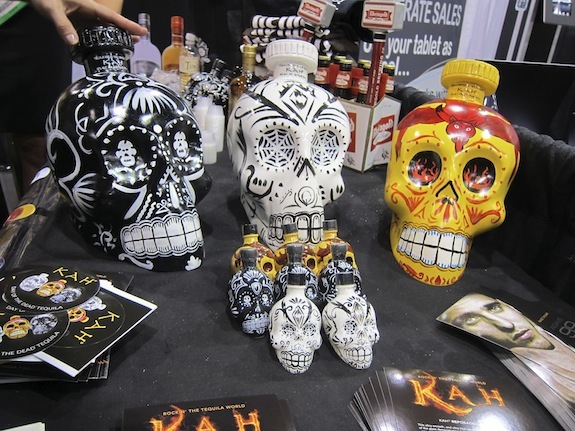 Tequila and Mezcal: Two major trends from the Nighclub and Bar show floor were tequila and mezcal. There were more products chasing the tequila dollar than almost anything else (second only to vodka). Some of these product were dreadful (see Toby Keith’s Mezcal below under worst of show) and some simply fantastic. Some of the lesser known “hidden gems” in this space include: Tequila Semental, a soft and lush line of tequilas using new American oak barrels; Mezcal Mano Negra with a new Tobala offering (an uncultivable strain of agave that is hard to produce and exceptional to drink); Kah Tequila, whose eye-catching packaging is superb; El Diablito Mezcal, a much softer and smoother style of mezcal that could be a great entry point into the category for tequila drinkers; and, Tequila Fortaleza, one of the best of the ‘hidden gems’ bunch. 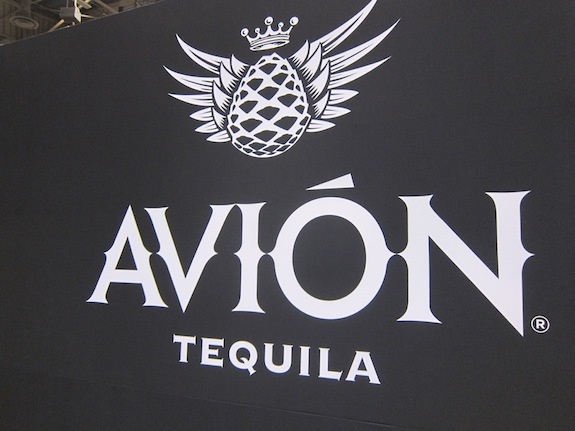 Tequila Avion: This brand has come a long way since it was used for a major story line in HBO’s Entourage. Now with a major distribution deal with Pernod Ricard, Tequila Avion is poised to become one of the key major players in the premium tequila space. The highlight, though, was Tequila Avion Founder Ken Austin who was on the show floor talking to bars, distributors, and night clubs. Ken Austin made a name for himself as a key player in Marquis Jets (which was ultimately sold to Warren Buffett), and he’s quickly on his way to becoming one of the major rising stars in the spirits industry. Ken Austin is extremely involved with all aspects of the brand (including all Twitter, Facebook, and brand work), a dynamic which reminds me of the Nolets family and Ketel One. Tequila Avion is working hard to get attention for all three of their marks (blanco, reposado and anejo), all of which are exceptional. 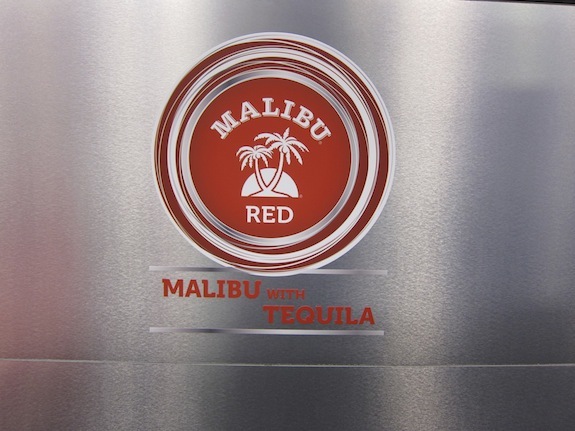 Malibu Red: Another Pernod Ricard product to make a big splash at the Night Club and Bar show was Malibu Red. Malibu is traditionally a nightclub-oriented product, so it made perfect sense for Pernod Ricard to make Las Vegas the key launch market for the new product. Perhaps the most notable part of the Malibu Red launch happened at the Marquee Club at the Cosmopolitan Hotel where musician Ne-Yo hosted the Top 100 party celebrating the top 100 nightclubs in the US. Marquee tops the list with jaw-dropping revenues of 60-80 MILLION dollars in sales a year. 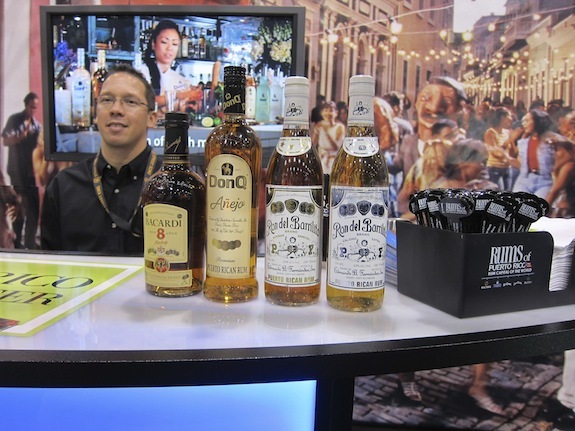 Rums of Puerto Rico: Instead of having a massive booth, Bacardi and Don Q both came into the show under the “Rums of Puerto Rico” banner. This is important because while these two rum companies tend to duke it out in the marketplace, they haven’t spent as much time working on promoting the category of Puerto Rico Rums. As the rum space continues to heat up and consumers get educated on the different regions of rum, clear communication about what makes Puerto Rico rum special will become increasingly important. One of the treats at this booth was bottles of Ron de Barrilito – while this rum isn’t available in the States yet, it was a superb example of high quality, delicious Puerto Rico Rum. 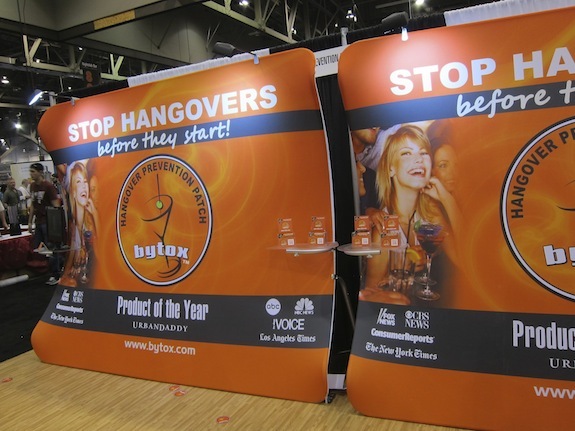 Hangover Relief: At the Nightclub and Bar Show there were almost as many hangover prevention and cure products as there were alcohol brands. Helping people who overindulge dodge the pain and suffering the next day is becoming big business and there were a myriad of companies all trying to come at the problem differently. The most notable products in the space include Bytox Hangover Prevention Patch, one of the few products that we’ve tried that consistently works. It’s like a nicotine patch, but this one is packed with B vitamins to prevent hangovers. GTOX Hangover Blocker failed to help prevent a hangover the next day, and someone didn’t get the memo about the 3oz fluid limit on airplanes, so at 4oz, this product won’t travel well. Hangover Joe’s, a morning-after remedy which has more caffeine than a 5 Hour Energy, may help you get up and go, but be prepared to crash hard several hours later. Energy Drinks: Another booming category at the Nighclub and Bar Show was energy drinks, with dozens of companies trying to become the next Red Bull or 5 Hour Energy. The brand with the biggest presence on the show floor was Street King Energy Drink, whose spokesman, 50 Cent, was at the show. Street King comes in a small 2oz bottle and is presenting itself as a cooler and hipper 5 Hour Energy. It also claims “6 hours” of energy – kind of like saying that this amp goes to “11”. 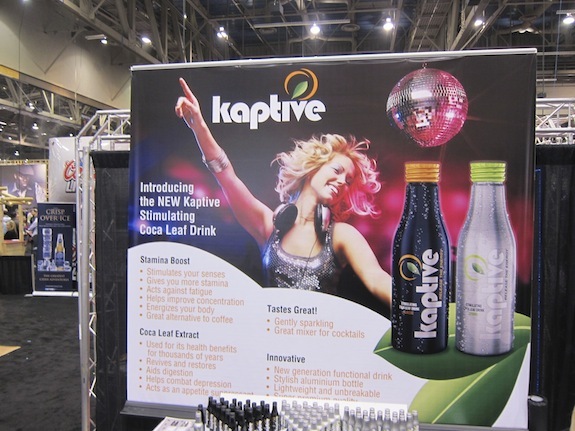 One of the most promising energy drinks to appear at Nightclub and Bar was Kaptive, made from de-alcoholized coca leaf. Kaptive comes in three varieties: Kaptive Stamina Classic, which tastes a lot like Red Bull; Kaptive Stamina Drink Fresh, which is lighter and more vegetal that tastes like coca leaf; and, Kaptive Coca Leaf and Green Tea, which is a non-carbonated tea. Kaptive Drink Fresh was one of the best products at Nightclub and Bar. Vodka: Whenever anyone asks, “What’s the new vodka?” we always answer VODKA! Classic cocktails and spirits with flavor are on the uptick, but so is vodka. Nightclub and Bar featured a wide array of vodkas, many of which were just private label bottlings from places like Sidepocket Distillery. There were some stand-out entries in the sea of “me too” vodka. 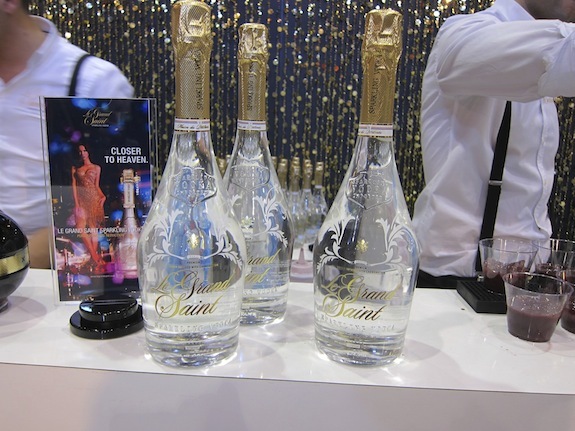 Le Grand Saint, a sparkling vodka that is priced under $30, is lightly carbonated and the brand claims that it’ll keep its carbonation with their patented cork for up to 60 days. Cold Steel Vodka brought some showmanship to the vodka space with a light up, color changing bottle. It’s a cleaver idea but we fear it may end up illuminating Grey Goose and Ketel One next to it on the shelf. Crop Organic Vodka had two stand-out flavored organic vodkas including cucumber and tomato, both of which were delicious. Of course there was also Titos Vodka, whose success really came from Las Vegas, and whose product opened the door for smaller distillers to step into the vodka game. Worst of The Show: With so many products at the Nightclub and Bar show, there were bound to be some that really missed the mark. The worst new product from the show, hands down, was Toby Keith’s Wild Shot Mezcal. Wild Shot typified everything that could go wrong with bad mezcal: it’s hot, poorly distilled, tastes horrid, and they put a worm in the bottle. Agave spirits have spent over a decade getting past the old perception of “eat the worm” and in one fell swoop Toby Keith has tried to knock it back. We hope that people who have this as their first mezcal experience will find a way to try a quality brand and see just how good mezcal can be. 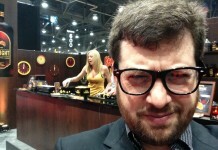 Another fail at the show was My Smart Bar, an automated bartending machine that tries to turn making cocktails into a vending machine. The results were disastrous (and the machine continued to malfunction throughout the show). You can’t take people out of the equation – it’s the service industry, not vending. Some experiences don’t need to be improved on, and a good Bloody Mary doesn’t need Benny’s Bloody Mary Beef Straw, which changes the drinking experience from a nice sipping experience to sucking on a meat stick. We’ll spare you the lewd parallels that this experiences emulates. Best of Show: If you had told us that the best thing we’d try at Nightclub and Bar was going to be a celebrity spirit, we would have probably made a sizable bet against it. If you then said it was going to be a new spirit from Sammy Hagar, we would have doubled down. To our surprise, the best product introduced at Nightclub and Bar is Sammy’s Beach Bar Rum. 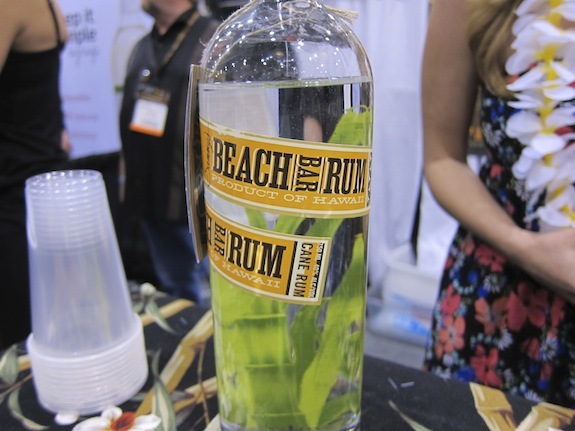 Made in Hawaii (Maui to be exact) from high quality sugar cane juice, Sammy’s Beach Bar Rum has all the wonderful vegetal and grassy flavors of sugar cane without much fire. It’s smooth, sweet, and flavorful, and it shocked and impressed the hell out of us. Expect to hear more about this rum in the not so distant future – it has the potential to be huge. Another rum ranked as our pick of Best of Show, the poorly named Rum Fire from Hampden Estates. Don’t let the name scare you off – this overproof rum, at 67% alcohol, is strong but maintains a smoothness and drinkability that’s amazing. Hampden Estates has traditionally made rums for other companies to blend (they are the heart and soul of Smith & Cross), so it’s exciting to see them finally come to the United States under their own brand with an exceptional rum. 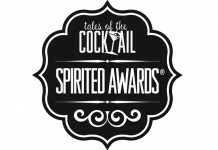 The Nighclub and Bar Show is an excellent barometer for the spirits business, and this year showed the field widen with a lot of new brands and companies looking to make their mark on an industry that is poised to really explode along with the nation’s economic recovery.